Excuse me for dismissing the annual “Did he? Or Didn’t he?” dance that Punxsutawney Phil has each February with his shadow, but these four words are the true herald of spring. Side Note: This year the reluctant-to-emerge varmint predicted six more weeks of winter. Did he actually see his shadow? Or, did he cash in his chips early because was he just too grumpy to appreciate waking up at sunrise to participate? Phil’s not-quite-so-famous counter parts, Staten Island Chuck (current owner of an 80% accuracy rating) and Shubenacadie Sam (Nova Scotia’s rodent in charge) both predicted an early spring, but let’s get back to the pitchers and the catchers. The call ripples across the baseball world each year just as the last Valentine’s Day rose arrangement is being delivered. PITCHERS, those who make their living throwing the cowhide covered spheroid with 108 red stitches, AND CATCHERS, those who squat sixty feet six inches away and call the shots, REPORT. Kissing their wives, girlfriends and action figures (children) goodbye, these “Boys of Summer” make their way to baseball diamonds in Florida and Arizona long before summer arrives. . . to PRACTICE. They’re not on their way to learn anything new. There is no anticipation of breakthrough technology being unveiled. It’s just PRACTICE. “We’re talkin’ about practice, man. Their day will include conditioning exercises, designed to prepare their bodies for the demanding daily rigors of the long season ahead. There will also be plenty of cardio sessions on the schedule, designed to build up stamina. The best of the best regardless their positions, as well as most of the mediocre, have a daily training routine already in place; so, why do they show up a full two weeks ahead of the rest of the team? PRACTICE, man! We ARE indeed talkin’ about practice. 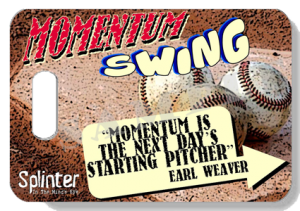 More specifically, we’re talking about something known as P-F-P.
Pitchers Fielding Practice is a specialized activity designed just for pitchers. Their job may start with throwing the ball, but it certainly doesn’t stop there. Pitchers, and only pitchers, have a host of other responsibilities. So. . . they PRACTICE. They practice fielding balls hit back to them and making the throw to first base. I know, it sounds childlike and insanely simple, but they invest time practicing this responsibility. They also practice fielding balls and making a throw to second base. Ah, hitting a moving target, maybe this one makes more sense. They practice running to cover first base immediately after throwing a pitch, in the event their pitch is hit in the direction of the first baseman and he is too far away from the base after fielding the ball to beat the runner to the bag. They practice pitching techniques designed to keep runners from getting a big lead, making it easier for them to steal the next base as the pitch is being delivered. They practice backing up throws to third base and home plate in the event a ball is hit into the outfield and a throw is coming in from the fielder. You see, it’s not enough to know that they should do these things. It’s not enough to talk about doing these things. It’s not enough to theorize how they would do these things, if ever an occasion arises wherein one of these activities should actually need to be done. They practice doing them. And, they do it over and over and over again, while no one else is around. THEY PRACTICE! And, having practiced over and over and over again during those last two weeks of February, they instinctively do the things they are supposed to do in the way they are supposed to do them when it comes time for those things to be done. There’s a trap. It’s not unique. It’s not something that only lures a select group. It’s not something that most can overlook as seldom hazardous. Make no mistake, this is universally dangerous and we are all at risk. It is the trap of philosophy. It’s the trap of well laid plans, well thought out responses, and well-intentioned reactions. It’s the trap of learning and feeling that knowledge is sufficient without deeds. “As a man thinketh. . . ” won’t get it done by itself. It never has and it never will. “As a man thinketh AND DOETH. . . ” Now that has a shot at success. 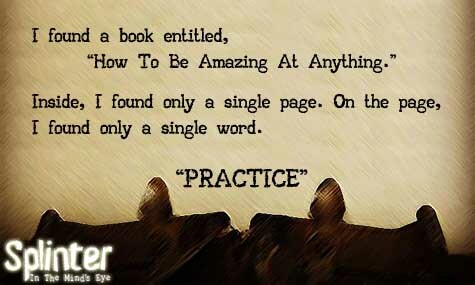 We think of practice as an action that a person does repeatedly in hopes of eventually becoming good at something. But practice is simply the act of doing something the way it should be done, repeatedly. Becoming good at it is merely the natural byproduct. 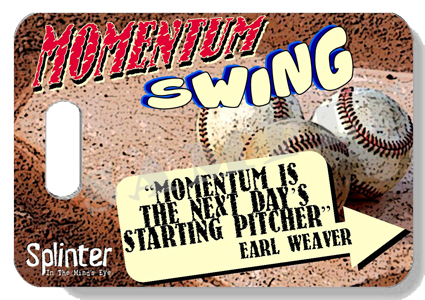 Want to swing momentum your way? PRACTICE! in the way they should be done.